I am always amazed when I watch my mother kiss my son goodbye. 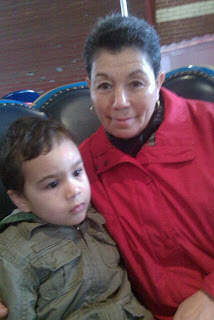 Often she will not leave my apartment without several hugs and kisses from her only grandson. My mother will give him a big squeeze and kiss him repeatedly on the cheek, “Bye my little pussycat.” And I roll my eyes because (a) she refers to my five year old son as a “little pussycat” and (b) she never ever called me anything else other than Lisa – unless esa Lisa counts. And when I witness the exchange I wonder: who is this overtly affectionate woman who claims to be mother? This is not the woman that raised me. The woman that raised me is one of the matriarchs that everyone fears respects. Born in Cidra, Puerto Rico my mother's family moved to New York City when she was nine years old. My mother is the kind of woman many would describe as “old school,” however her true power rests on the values of two worlds: old and new, Cidra and New York. A clash of two cultures – whether she realizes it or not. My mother is a big believer in tough love and teaching lessons. She was quick with a slipper and quicker with her hands. She moved so swiftly, you didn’t realize you were given a cocotazo, until you felt your scalp stinging. Needless to say - I got the slipper often. As for her lessons, the older I get, the more I can appreciate what she tried to instill. We spent most of my teenage years arguing, clashing the way mothers and daughters often do. When I was about sixteen years old, I yelled, “When I have kids, I’ll never bring them to your house.” To which my mother replied, “I want that in writing.” So I wrote down my words on the back of a bank deposit slip, signed and dated as if it were a legal document. A few years ago, while having dinner at her house – my mother brought out the note to show my husband. We all laughed because my son (who was two at the time) had just spent the night. And now I laugh because every afternoon my mother takes the train from Queens to the Bronx so that she can wait for her grandson to come home from school. She stays until me or my husband come home from work. She sits in on his SEIT therapy sessions, makes dinner, washes dishes - even manages to do laundry. And when I try to pay her - she shoves my hand away. I love watching my mother and son together – the bond they have is special. And I’m grateful that my mother kept the note I wrote so many years ago. It makes me realize how wrong I was and how lucky I am to have a mother like her. And that my son benefits from having her as his Abuela. I learned my lesson - nearly 20 years later. Maybe my mother is just as patient with me. That is just awesome! What a Blessing your son has! I'm Puerto Rican and my son also has spectrum issues and I'm really excited to find your blog! You're a great writer and I'm looking forward to reading more from you. Thank you all so much! My mother is really great with my son. She drives me crazy (LOL) and we don't always agree on certain things, but I'm lucky to have her support. All the therapists that meet her are always impressed - saying that she should have been a therapist. More importantly, she let's the therapists do their job - even though she hates hearing him cry. She knows and respects that the therapists are trying to help. Li - I am so happy that you found me! Thank you so much. 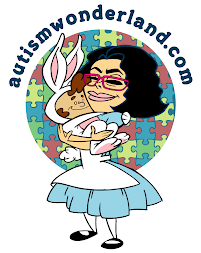 One of the reasons why I started this blog is because I feel there is a lack of Latinos speaking out on autism.